Get the double of cleanliness and care for your hands with Gold Liquid Classic Clean Hand Wash and Dettol Skincare Liquid Handwash. Your Trusted Dettol offers a new and improved Dettol Gold Liquid Classic Clean Hand Wash. It is specially formulated to protect you from 100 illness causing germs. It gives 10 times better protection than any ordinary soap. Handwashing is one of the most important and simple hygiene steps to prevent the spread of infection. Dettol handwash everyday protects from these germs and helps keep your hands clean and refreshed. Recommended by the Indian Medical Association, Dettol can help prevent diseases like cold and flu with proper hygiene. Protects against everyday germs including those that can cause skin infections, respiratory infections (Influenza) and Gastroenteritis (such as Salmonella and Escherichia Coli). 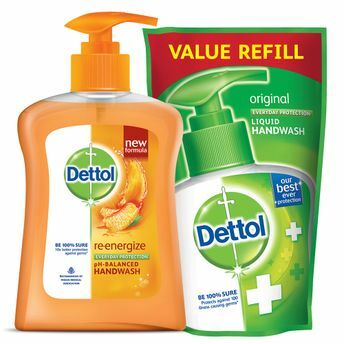 Your Trusted Dettol offers a new and improved Dettol Skincare Liquid Handwash. It is specially formulated to protect you from 100 illness causing germs. It gives 10 times better protection than any ordinary soap. Handwashing is one of the most important and simple hygiene steps to prevent the spread of infection. Dettol handwash everyday protects from these germs and helps keep your hands clean and refreshed. Recommended by the Indian Medical Association, Dettol can help prevent diseases like cold and flu with proper hygiene. Protects against everyday germs including those that can cause skin infections, respiratory infections (Influenza) and Gastroenteritis (such as Salmonella and Escherichia Coli).